HHS Secretary Tom Price has tipped his hand and revealed some potentially controversial stances on his preferred measures for repealing and replacing the Affordable Care Act. Responding to questions from lawmakers during his confirmation process, Price said healthcare reform should allow states to choose if they want to charge women more for coverage; he also supported capping Medicaid funding and using high-risk pools to provide coverage for people with pre-existing conditions. Price's written responses have not been released publicly, but were provided exclusively to Modern Healthcare. The responses give a more candid look at the ideas that Price may push for Congress and President Donald Trump to support. Several suggestions are already under consideration in a bill released by GOP House leaders last week. An HHS spokesman said the ideas that Price is championing for Congress to incorporate into healthcare legislation will return authority to the states and empower patients by providing them with financial relief, more choices and higher quality care than they currently receive. In his written response to Senate Finance Committee Ranking Member Ron Wyden's question on whether insurance companies should be required to charge men and women the same rate for premiums, Price indicated the matter may be best addressed by states. “The setting of premiums is something that has historically been a matter of state law and regulation, so that the dynamics of that state and its population and risk pool and consumer behavior can be taken into account,” Price said. Before the Affordable Care Act, insurance companies were charging women more for their health insurance compared to men. A 2012 report from the National Women's Law Center found that women were paying $1 billion more annually for health insurance than men. Price's response misses the point of the ACA's premium rate-setting reforms, according to Dania Palanker, an assistant research professor at Georgetown University's Center on Health Insurance Reforms. The healthcare reform law didn't repeal states' responsibilities to oversee rate-setting, it just prevented insurers from discriminating against women with their rates, she said. If those protections went away, the implications would be severe, according to Jean Hall, director of the Institute for Health and Disability Policy Studies at the University of Kansas. Written responses to lawmakers' questions reveal Price wants to give states more authority and give patients more choices. Price also expressed support for using high-risk pools to cover individuals with pre-existing conditions, highlighting a Blue Cross and Blue Shield plan's pool as a potential model for the reforms. Before the ACA, high-risk pools were often the only coverage option for people with serious pre-existing conditions who didn't have access to health insurance from an employer or the government. The pools were established as a way to ensure those individuals maintained coverage while at the same time keeping costs low for other consumers in the individual marketplace, Price said. Opponents of the pools have said that historically such mechanisms have not worked. Before the ACA, high-risk pools were prohibitively expensive and covered less than 1% of the total uninsured population in the 35 states that operated them, Hall said. Premiums ranged from 125% to 200% of the average individual plan premium in the state, and deductibles were often much higher than those seen in the marketplace. In addition, many plans had annual and lifetime coverage caps. “They were not successful in any way in bringing down costs,” Hall said. Former acting CMS Administrator Andy Slavitt said it's unclear if there has ever been a truly successful high-risk pool. He said there is much more evidence that reinsurance programs—which transfer funds from insurers with healthier patients to those with more high-cost enrollees—have worked better. The federal government has used reinsurance programs in Medicare Part D and the ACA to help keep premiums stable and affordable. According to Georgetown's Center on Health Insurance Reforms, the ACA's temporary reinsurance program reduced net claim costs for high-cost consumers by about 10% to 14% in 2014, and health insurance actuaries have found reinsurance to be a stabilizer of premiums in the individual market. The ACA's reinsurance program ended in 2016, which some actuaries note is part of the reason why premiums increased in 2017, according to the center. Yevgeniy Feyman, a Republican analyst, agreed with Price that high-risk pools could be a strategy to help people with pre-existing conditions, but does not believe they are the only option. The bill introduced last week addresses coverage for pre-existing conditions. It maintains the standard that people with pre-existing conditions maintain coverage, but allows insurers to charge higher premiums to those who let their coverage lapse. The bill does allow for federal funds to be used to create high-risk pools in the event individuals don't maintain continuous coverage and have trouble affording other coverage. Price also expressed support for capped federal funding for Medicaid. And he shot back at a common criticism that the change would hinder states' attempts to respond to unforeseen costs associated with public health crises, such as the Zika virus or rising prescription drug costs. 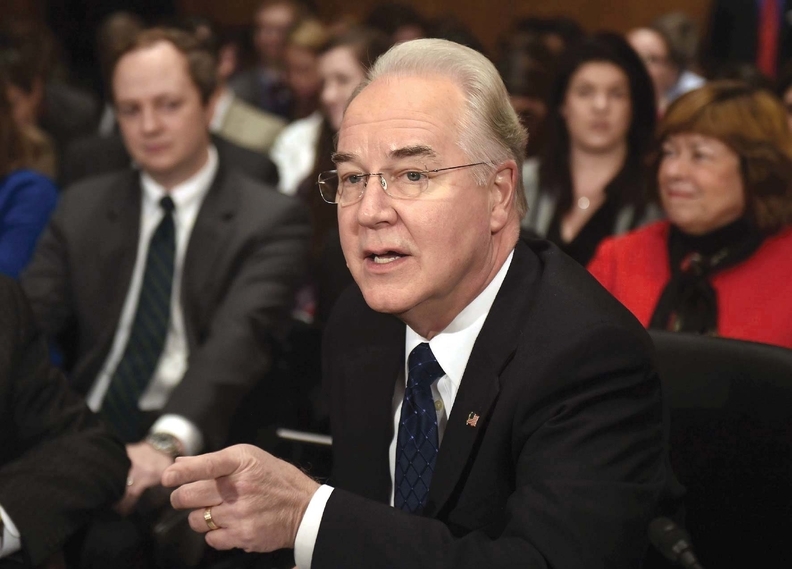 He said he believes Congress could help states plan for unforeseen public health challenges by drafting legislation that “would encourage states to save for such eventualities,” Price said. States already tend to have a rainy day fund, but this funding is intended to address revenue shortfalls and economic downturns, not the catastrophic consequences of a healthcare crisis, said Dee Mahan, director of Medicaid initiatives at Families USA. “In the same vein, perhaps the federal government should also do away with disaster relief, leaving to the states the task of setting up reserves to deal with losses from Category 5 hurricanes,” Henry Aaron, a health economist at the Brookings Institution, said with a tinge of sarcasm. Others say Price has a point about having a contingency plan in the event of an emergency. “If states are worried about an emergency event under blocked Medicaid funding, they should plan for it. It is correct to say that if states are worried about funding emergent public health crises out of current funds, they should sock away money in a rainy-day fund for such contingencies,” said Michael Cannon, director of health policy studies for the libertarian Cato Institute. Under the bill currently being reviewed by Congress, Medicaid would be converted from an entitlement program to one that provides a per capita cap on funding to states, depending on how many people they have enrolled. In his responses, Price also told lawmakers that he felt more states could benefit from adopting an approach used in Indiana's HIP 2.0 Medicaid program, which charges beneficiaries premiums and locks them out if they fail to pay. The HHS secretary said HIP members are more engaged with their providers, less reliant on emergency rooms and more satisfied with their coverage than traditional Medicaid members. That type of program could help Medicaid members transition successfully from the government program to commercial health insurance plans, an outcome he feels should be an important factor in Medicaid design. However, there are serious questions over whether the model has truly been successful. Indiana recently submitted a report that appeared to inflate the program's performance, according to staffers at the left-leaning National Health Law Program and Center on Budget and Policy Priorities who reviewed the data. Before the model is expanded, the CMS should conduct an independent evaluation to see if it truly works compared with a Medicaid program that doesn't have the conservative provisions, said David Machledt, senior policy analyst with the National Health Law Program. “If federal and state officials are confident in the efficacy of the HIP 2.0 demonstration, they should be eager to resolve any data inconsistencies and to hold their program up against Medicaid expansions in other states,” Machledt said. Price is backing legislation that will allow physicians to bill seniors for charges that are more than the rates approved by Medicare. He claims the move would draw more physicians to enroll in the program, but several physician groups say it could backfire. Current law does not allow participating physicians to bill patients more than the Medicare payment rate for any service. Providers not in the program can balance bill Medicare beneficiaries if they choose such an arrangement. In response to a query from Sen. Bill Nelson (D-Fla.) during his confirmation process, Price said he favored changing the law to let doctors recoup unreimbursed Medicare costs, a practice known as balance billing. Price, a retired orthopedic surgeon, said balance billing would entice more providers to work with Medicare beneficiaries. Patients typically get “surprise” bills when a physician practice operating inside a hospital isn't part of an insurer's network. It's been happening more frequently in recent years as insurers select fewer providers for their networks to keep premiums down. Several states have passed measures to prevent the practice. Now, as secretary of HHS with the ear of President Donald Trump and a member of the party that controls both chambers of Congress, he is in a better position to make that long-desired change a reality. Price's spokesman declined to expand on his written comments. Representatives from the American Medical Group Association and American Academy of Family Physicians said that the approach might lead providers to limit their Medicare patients to those who agree to balance billing. The change in law could be “a little dangerous,” potentially creating inequitable access for low-income people, according to Shawn Martin, senior vice president for policy at the AAFP. Providers have complained the final rule contains too many reporting requirements. To comply with all the ones listed in the rule would cut into patient care time, they said. Price last week missed two high-profile opportunities to take a stand on health information technology policy, but used a third communication to ensure that the federal government will continue to push health IT interoperability. At a White House news conference, he spent the bulk of his time speaking in support of a House bill to repeal Obamacare. In neither instance did he specifically mention health IT policy initiatives the new administration might take. In the documents acquired by Modern Healthcare, Price elaborated on policy positions he'd given during his congressional confirmation process. Price responded to questions from Sen. Bob Casey of Pennsylvania by writing that given universal agreement on the need to improve patient care and reduce costs, “One way to do so is for the federal government to continue to promote the growth of health information technology and electronic health records. “One success in this space over the past several years has been the development and growth of the Direct Exchange network, which has allowed for millions of healthcare record exchanges over the past several years,” Price said. Direct messaging is a collection of electronic health information exchange standards and implementation specifications developed in a partnership between private-sector participants and the Office of the National Coordinator for Health Information Technology at HHS. When asked about his support for Direct Exchange specifically, Price said, “Electronic information sharing, as supported by interoperable health information technology (IT) systems, impacts overall care and the patient experience.” Patients and providers often rely on the fast exchange of relevant, trustworthy information across health IT systems. “Methods to improve flexibility and patient engagement, and clear the way for increased health IT interoperability should be examined as we work to improve healthcare delivery,” Price said. The Medical Group Management Association has sent a letter to the Trump administration with a long list of health IT program reforms. Among them are the requirements to simplify existing programs outlined in the 21st Century Cures Act, which passed last year. But so far, the ONC, which was the venue for most of rule-writing related to health IT under the Obama administration, is without a Trump-appointed leader. And, rule-writing for Cures is also partly hamstrung since the federal government is operating financially under rules that limit expenditures for new programs created by Cures. Robert Tennant, a health IT adviser at the MGMA—like most others in health IT—is watchfully waiting. “We're very hopeful in this environment of deregulation and reducing administrative burden that the secretary will address some of the key issues that affect physicians,” Tennant said.